Joanne Rowling was as surprised as anyone by the phenomenal international success of her Harry Potter books, which are hugely popular with both children and adults. Apparently there's nothing a Muggle likes better than reading about a boy who takes the train from Platform 93/4 at King's Cross Station for Hogwarts School of Witchcraft and Wizardry (somewhere in Scotland), there to act out his fated role in a cosmic battle between the forces of good and evil, with only the odd moment to polish up his prowess at Quidditch. For over five years Joanne Rowling planned the Harry Potter books, keeping very quiet about the magical world she had conjured up in her highly visual imagination. Unusually in children's fiction, Harry and his friends are growing older year by year. A film version of the first in the series, 'Harry Potter and the Philosopher's Stone' (1996), was released towards the end of 2001. The author, who plans seven books in all, is already looking forward to sinking back into anonymity and doing something completely different. 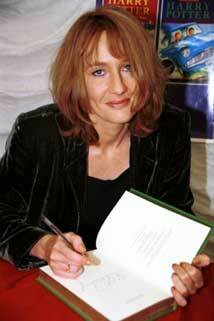 J K Rowling, Edinburgh, 1999.